My friend Danielle DiMartino Booth, formerly at the Dallas Fed and now writing on her own at the eponymous website www.dimartinobooth.com, covers a wide range of topics that are affected by central-bank policies. Today she deals with credit spreads and specifically high-yield bonds. It’s not a long piece, and it’s easy reading, even if it won’t make you comfortable. Danielle and I have been friends for many years, and I always enjoy being able to get together with her and share notes. I think she is going to be an increasingly visible voice in the world of central bank critics. The actual writing process is hard work. For whatever reason, I spend a great deal more time writing and editing a book that I do on my letters – which probably shows. There is something about calling a writing project a book as opposed to a letter that, at least for my generation, seems to provoke more effort and angst. The reality is that my weekly letters are actually far more accessible and will probably be on the Internet longer than my books, which so far haven’t been posted in toto. And speaking of writing, I’m going to go ahead and hit the send button and go back to the process of creating a book. I hope your summer (if you are in the northern hemisphere) is going well. I have friends and business partners coming in this afternoon and evening, and we’ll be talking about some new offerings that I will soon be able to tell you about. Stay tuned. Having spent a chunk of his youth “shopping” them, Jim Croce came to know a thing or two about junkyards. In those youthful days, should his clunker de jour be missing some vital part or parts, a trolling expedition through South Philly’s scrap heaps was always the enterprising Croce’s preferred method of procurement. Amid all of Croce’s parts foraging, it was a universal joint for a ‘57 Chevy and a ‘51 Dodge transmission, two must have and must-be-cheap or, better yet, free, parts that the legendary folk singer still recalled. He also reminisced that junkyards could and would provide a no frills, but highly motivated and easy way to get in some cardio, as in running for your life. So was born the junkyard dog yardstick by which to measure the meanness of one Bad, Bad Leroy Brown, Croce’s hit which landed at the top of the charts 42 years ago this week. As for high yield bond analysts, they aren’t exactly known for catchy turns of phrase. However, in recent weeks, they’ve shed the dry and donned the dramatic, as you’ll soon see. 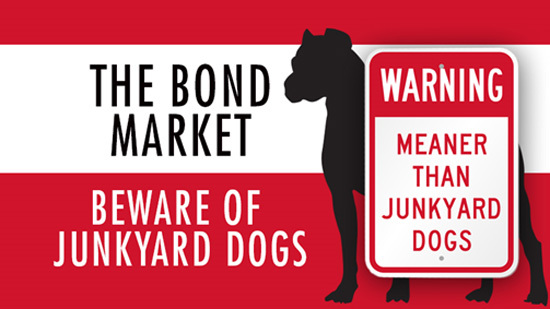 Such is the overheated state of the junk bond market this sweltering summer. Legendary high yield investor Marty Fridson shares Melentyev’s concerns and has for some time. By his best estimate, high yield was already in “extreme overvaluation” territory on June 30th, defined as being one standard deviation above fair value. Flash forward two weeks, and he calculates that the standard deviation has doubled. Defining bond valuation also requires one employ “spreads,” which compare the prevailing yields on a given credit to a supposedly risk-free Treasury of a comparable maturity. And that means you have to get down to the nitty-gritty of measuring risk in basis points (bps), or hundredths of a percentage point. In the event your eyes have rolled into the back of your head, listen up! This is important folks, your sweet grandparents could well own junk bonds in their desperate need to generate yield on their atrophying retirement funds! With that preamble posited, on July 15th the option-adjusted spread on Bank of America Merrill Lynch’s High Yield Index was 542 basis points. That compares to 621 bps on June 30th. The lower the spread, the less extra compensation investors are demanding for taking on the added risk of being exposed to, well, junky bonds. Now in light of this, just how did mom & pop investors react to the price increase? Well how else? They poured $4.4 billion into high yield mutual funds, the second highest weekly inflow on record after March 2nd’s $5.3 billion inflow. The question is, will investor insouciance ever come back to haunt them? They, as in investors, certainly don’t seem to think so. The Daily Shot is a must-read email proffering just about every graph that’s important for investors in one succinct one-stop shop, and it’s free. The Shot’s editor, the estimable Dr. Lev Borodovsky, is notoriously judicious with his editorial additives. So when he adds a quip, his readers understandably sit up and take note. Or not. The Shot goes on to depict the price-to-earnings ratio on the S&P 500 at the highest level since at least 2006. “These valuations rely on extremely low long-term rates,” Borodovsky cautioned. As a punctuation mark, as in exclamation, Borodovsky features two charts on the high yield market. At the risk of over-paraphrasing, the high yield market is apparently no longer concerned about energy prices, which have yet to stage the oft-predicted blistering rebound. How so? Despite the defaults that continue to emanate from the oil patch, the performance of high yield bonds has completely divorced itself from that of still-depressed crude prices. The mirror image of this nonchalance is that investors are no longer demanding a premium level of compensation for owning high yield energy issuers vis-à-vis their non-energy brethren. As for Deutsche’s Melentyev, he isn’t bothering to wait for the ink to dry on the clear message written on the wall. In his latest note to clients, he ratchets up his expectations for HY (high yield) defaults to rise this year beyond his worst case initial scenario – and it ain’t just an energy story. In the event you’ve fallen off Planet Earth in recent weeks, the global corporate default count, as in companies reneging on their promises to make good on those coupon payments, is at the highest level since 2009. And if your memory’s eye has erased 2009 to prevent permanent scarring, the economy was in a full meltdown state back then. Let’s get this straight. Defaults are going through the roof and investors are flocking to the sector in record numbers? And how. By Siilaberg’s latest tally, covenant protections are at their weakest level in recorded history. To translate, investors’ collective interests are as vulnerable as they’ve ever been. Though the leveraged loan market remains open for business, Siilaberg is apprehensive about what’s just over the horizon given stretched valuations. Overreaching central bankers are in fact doing more harm than good at this juncture. Though small investors may not be wise to the damage being wrought, veterans of financial market warfare are weary to the point of exhaustion. The endless waiting for Godot has apparently worn their resolve down to near nothing…with good reason. For all of central bankers’ Herculean efforts, expectations that U.S. job losses will accelerate are at a two-year high while households’ prospects for the economy over the next year have fallen to a two-year low. Pride will surely precede the fall of the orthodoxy of today’s accepted monetary policy framework. But at what cost? “Everyone in the world needs yield and nothing else matters,” Melentyev laments. “This has never ended in any sort of a problem before, so we can all go back to sleep.” And what happens when we’re abruptly shaken from our slumber? Thank you Chair Yellen & Co. for rendering snarling, lawn mower toting junk bond dogs cute and cuddly critters to retirees on fixed incomes.